This delicious baked rice pudding from the Maghreb, it is creamy, fragrant and delicately flavoured with aromatic sweet Moroccan spices. Almond milk is also a nice alternative for the full fat milk. Lightly grease a 1.2 litre baking dish or casserole with the butter, scatter the rice into the dish and place to one side. Place the milk and cream in a pan, add the sugar, cinnamon, ginger, saffron, vanilla pod and bring to the boil. Simmer on lowest heat for 5 minutes to infuse the flavours. Strain the milk through a fine strainer over the rice and stir well. Cover the dish with a lid or foil and bake for 1 ½ hours or until the rice is just tender. Meanwhile place the quince jam and rosewater in a small pan and heat gently together. 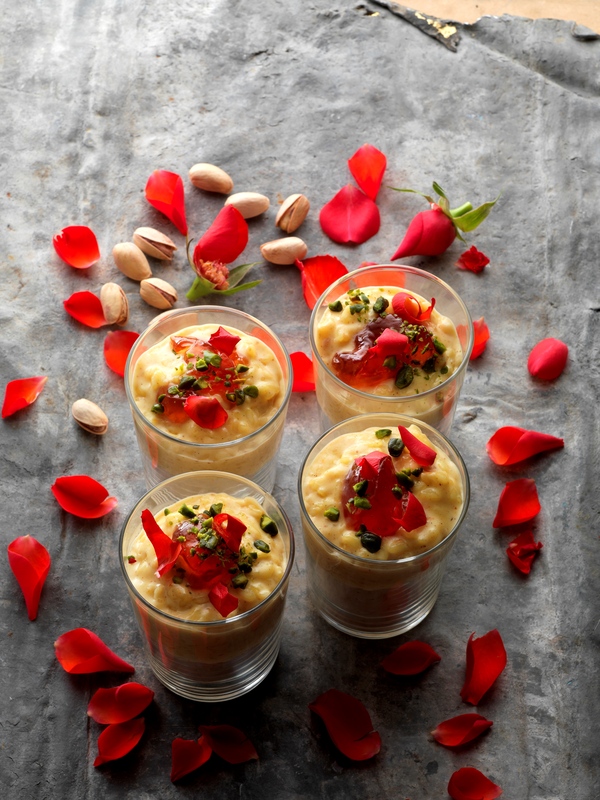 When rice pudding is cooked , transfer to serving bowls and top each with a good dollop of the jam and a scattering of pistachios. Garnish with the rose petals if using and serve.